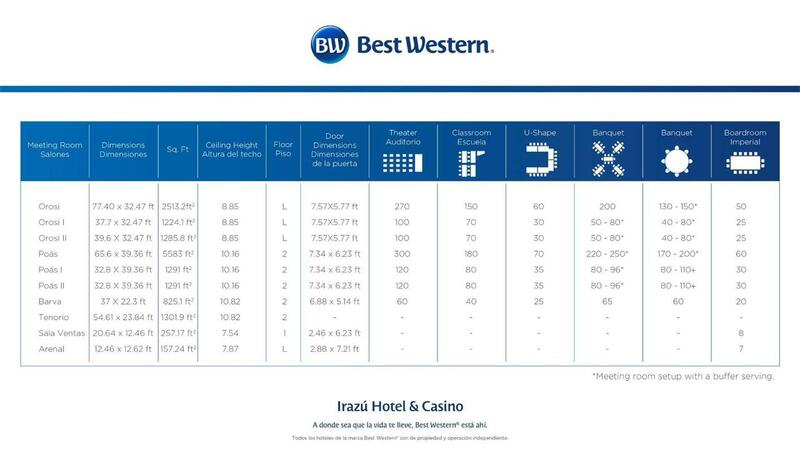 The Best Western Irazu Hotel & Casino has 7 meeting rooms available for your corporate meeting or social event a success. The Best Western Irazú culinary team will design a catering menu to perfectly suit the style and mood of your event. Our professionals will guide you through the entire planning process, leaving no details overlooked, offering the skills and expertise needed to make your event a success. Complete the below form and start planning your meeting at Best Western Irazú Hotel & Casino. I'd like to receive emails, updates and newsletters from Best Western Irazú Hotel & Studios.